Caesarean scar pregnancy (CSP) is an uncommon type of ectopic pregnancy. Here, we aim to present management of our four CSP cases. These cases were enrolled between January 2012 and January 2016. All the patients treated with 50 mg/m intramuscular methotrexate (MTX) injection. 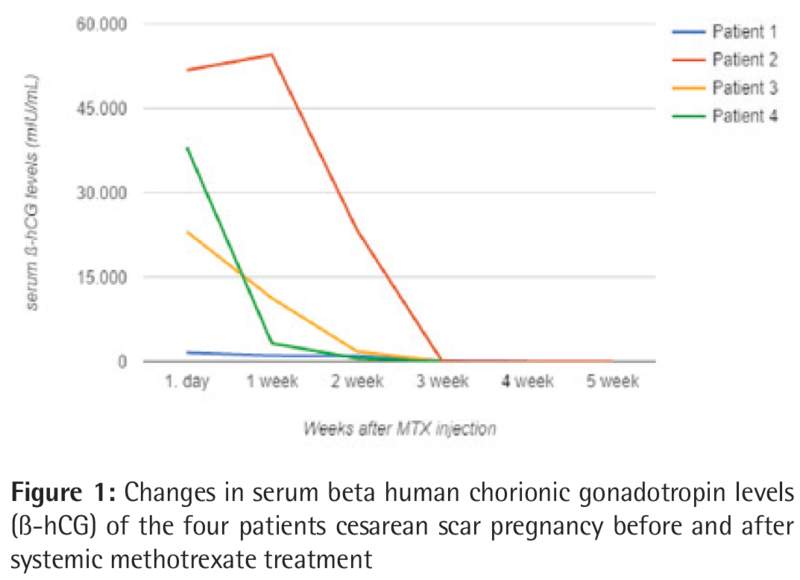 After treatment, patients were followed until their serum beta human chorionic gonadotropin (β-hCG) levels reached <5 mIU/mL. All the patients were diagnosed at the first trimester, with the average gestational age of 7 weeks. All patients were cured without surgery. The mean time passed until β-hCG reached <5 mIU/mL was 28 (range, 22-35) days. Only one patient needed second dose MTX. Based on this limited number of case-series experience, it seems that systemic MTX should be the first line treatment for CSP instead of surgery. Cesarean scar pregnancy (CSP) is defined as an ectopic pregnancy which is located in the previous cesarean scar, within myometrium and connective tissue (1,2). In respect to high cesarean rate around the world, the frequency of CSP rate is increasing worldwide (3). CSP rate is 1 in 2.000 pregnancy and 6% of the ectopic pregnancies are CSP located in previous cesarean scar (4). It is hypothesized that the mechanism for fault implantation may be due to the migration of the embryo through either a wedge defect in the lower uterine segment or a microscopic fistula within the scar (5,6). Reported risk factors for CSP are adenomyosis, in vitro fertilization, previous dilation and curettage, and manual removal of the placenta (7). In this report we aim to describe 4 women with CSP and discuss their clinical presentations, diagnoses and especially medical management of CSP, along with the published literature. Patient 1 was admitted to hospital with 7 weeks 4 days gestation and vaginal bleeding. The ultrasound exam revealed CSP, she was treated with single dose systemic MTX and it took 35 days to drop the beta human chorionic gonadotropin (ß-hCG) levels under 5 mIU/mL. Patient 2 was admitted to hospital for routine examination, and ultrasound examination revealed CSP, ß-hCG level was 23054. Single dose systemic Mtx was given to the patient and it took 22 days to ß-hCG levels become undetectable. Patient 3 applied to the hospital for the first visit. During her examination, CSP was diagnosed on the ultrasound exam. Single dose systemic MTX theraphy was administered to the patient and 27 days later ß-hCG become levels undetectable. Patient 4 was admitted hospital with 7 weeks and 1 day gestation and vaginal bleeding. ß-hCG levels was 1570 and ultrasound examination revealed CSP. She was given 50 mg/m2 systemic MTX therapy, ß-hCG levels were followed on day 1st, 4th, 7th, as ß-hCG levels did not decrease, a second dose MTX was given on day 8. After second dose of MTX, the ß-hCG levels became undetectable on the 20. Day of second dose, 28 days after the first dose. Four women with ectopic CSP were admitted to our hospital between January 2012 and January 2016. Two of them had vaginal bleeding and the others had no symptom other than amenorrhea. All the patients had ultrasonographic (USG) assessment and measurement of serial serum ß-hCG levels. The USG assessment of the 4 patients revealed common findings: A closed internal cervical ostium, a normal cervical length, and an empty uterus. In all the pregnancies, the intramural location of the gestational sac was consistent with the previous Cesarean scar. None of the patient had fetal cardiac activity. Primarily, medical management was chosen instead of surgery for all patients. Before the MTX administration, liver and kidney functions were evaluated. The age, symptom, parity, USG assessment, serum ß-hCG level, management, need for additional therapy and follow-up period of the 4 patients are summarized (Table 1). Systemic MTX 50 mg/m2 was given to all of the patients. The size of the gestational sac and the treatment ß-hCG levels were followed until the gestational sac shrank and the ß-hCG level reached <5 mIU/mL. Serum ß-hCG levels were checked before treatment and then on the 4th and 7th days of treatment. Progression of ß-hCG levels was showed in Figure 1. Only one patient was given second dose MTX because of the plateau of ß-hCG levels. The second dose was given same as the primary injection. The B-hCG level was undetectable for a maximum of 28 days (Figure 1). After MTX treatment ultrasonography was repeated. USG assessment showed reduction in mass. No further intervention was made. One of the patients experienced vaginal bleeding during the follow-up. Patients were hospitalised in order to follow hemoglobin levels. Vajinal bleeding stopped after the second dose of MTX. Complication did not occur due to treatment or CSP in patients. The increase of caesarean section prevalence, gives a rise to an increase of cesarean section complications. Regarding cesarean scar pregnancy is an uncommon type of ectopic pregnancy, data about caesarean scar comes from retrospective or observational studies. Optimal approach for treatment has not been established and thus it is essential to recognise localisation of CSP early. CSP treatment options consist of systemic or local MTX injection, local potassium chloride administration, surgical removal of CSP, dilatation and curettage, hysteroscopy, uterine artery embolisation and hysterectomy. Also, there are some novel treatment options like uterine artery chemo-embolisation with dilatation and curettage or epidermal growth factor receptor inhibitor use (8). Most women who diagnosed as CSP are in their reproductive ages and preserving fertility is another issue about treatment. Medical treatment appears to be most appropriate first line treatment and has been adopted in our clinic as the primary treatment for CSP. At first, the success rate of systemic MTX was reported to range between 71% and 80%, with a hysterectomy rate of only 6% (9). A systematic review also showed that hysterectomy was needed in 4% of patients after first-line systemic MTX treatment (9). In our study systemic MTX treatment was successful in all cases, despite the wide range of ß-hCG levels. Even though the ß-hCG levels get higher as the diagnosis usually delayed compared to tubal ectopic pregnancies, MTX treatment was successful on these values either. There were not any complications occurred due to the treatment. Only one patient needed second dose systemic MTX and interestingly whose ß-hCG level was the lowest. And the time needed for ß-hCG levels to become undetectable were 5 weeks at most. Since surgical treatments for CSP carries risk of hysterectomy, bleeding and uterine rupture, medical treatments should be the first treatment option. Besides low complication rates, rapid resolution time is another advantage of systemic MTX therapy. On the other hand surgery is the first treatment of choice when the woman is hemodynamically unstable patient or histological confirmation is necessary. The majority of patients get pregnant spontaneously following uterine-conservative treatment of CSPs. The conception rate is 87.5% (10). It is advised that the conception date after CSP should be at least 1 year in as much as the uterine scar may be healed and there is no prevention method. (10). Limitation of this report is low number of patients and retrospective nature of the study. In conclusion, our study showed that CSP can be successfully managed with systemic MTX therapy even in patients with high hcg levels. Although there is no consensus on treatment method for CSP, from this reported series, we suggest that systemic MTX treatment should be first line approach in clinically stable women. Managing with CSP, women need to be assessed based on their own medical conditions and findings. Roberts H, Kohlenber C, Lanzarone V, et al. 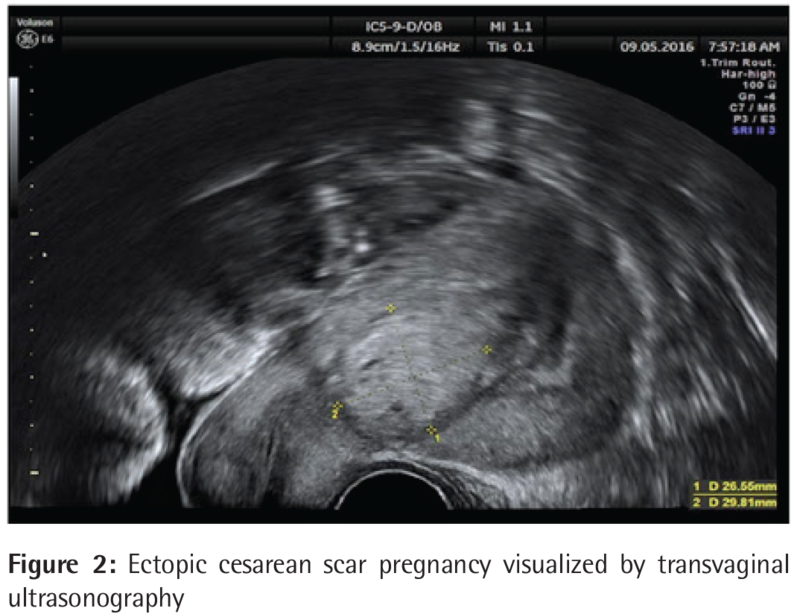 Ectopic pregnancy in lower segment uterine scar. Aust NZJ Obstet Gynaecol. 1998;38:114-116. Gao L, Huang Z, Zhang X, et al. Reproductive outcomes following cesarean scar pregnancy - a case series and review of the literature, Eur J Obstet Gynecol Reprod Biol. 2016;200:102-107. Ngu SF, Cheung VY. Non-tubal ectopic pregnancy. Int J Gynaecol Obstet. 2011;115:295. Rotas MA, Haberman S, Levgur M. Cesarean scar ectopic pregnancies:etiology, diagnosis, and management. Obstet Gynecol. 2006;107:1373-1381. Marchiolé P, Gorlero F, de Caro G, et al. Intramural pregnancy embedded in a previous Cesarean section scar treated conservatively .Ultrasound Obstet Gynecol. 2004;23:307-309. Ash A, Smith A, Maxwell D. Caesarean scar pregnancy. BJOG. 2007;114:253-263. Vial Y, Petignat P, Hohlfeld P. Pregnancy in a cesarean scar, Ultrasound Obstet Gynecol. 2000;16:592-593. Lan W, Hu D, Li Z, et al. Bilateral uterine artery chemoembolization combined with dilation and curettage for treatment of cesarean scar pregnancy: a method for preserving the uterus. J Obstet Gynaecol Res. 2013;1153-1158. Kanat-Pektas M1, Bodur S2, Dundar O, et al. Systematic review: What is the best first-line approach for cesarean section ectopic pregnancy? Taiwan J Obstet Gynecol. 2016;55:263-269. Wang Q, Peng HL, He L, et al. Reproductive outcomes after previous cesarean scar pregnancy: follow up of 189 women. Taiwan J Obstet Gynecol. 2015;54:5513.